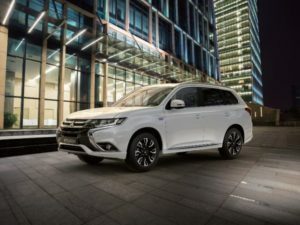 A collaborative project in the Netherlands has installed its first vehicle-to-grid charging point, for a trial using a Mitsubishi Outlander PHEV as a backup energy store. There are more than 25,000 Outlander PHEVs in the Netherlands. Mitsubishi Motors Corporation (MMC) is working with charging network operator NewMotion, Dutch grid operator TenneT, and V2G technology supplier Nuvve on a system which could use vehicle batteries as reserve capacity for the grid during periods of peak demand. It would enable drivers to sell energy from their vehicle’s battery, back to utility companies. Backed by tax incentives, the Netherlands was an early adopter of plug-in hybrids, with more than 25,000 Outlander PHEVs on the road. Mitsubishi said it hopes to create new business opportunities for owners using this system. The charging points will be supplied by Enel, and use Nuvve vehicle-to-grid technology. Those two companies have previously worked with Nissan on similar projects across Europe, based on the Nissan LEAF.